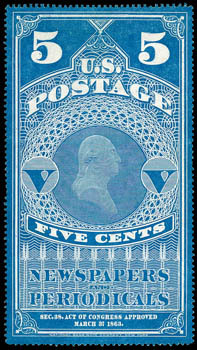 Newspaper, 1865, 5¢ light blue, without gum as issued, beautifully centered amid well balanced margins, fresh with strong color, an Extremely Fine gem; with 2014 P.S.E. certificate. ONE, IF NOT THE FINEST EXAMPLE OF THIS VERY SCARCE FIRST ISSUE NEWSPAPER SHADE VARIETY. Newspaper, 1894, 6¢ intense black, full o.g., wonderfully centered amid large margins all around, bold color and remarkably fresh, Extremely Fine and choice; with 2014 P.S.E. Graded certificate (XF 90, SMQ $9,000). AN EXCEPTIONAL LARGE MARGIN MINT EXAMPLE OF THE 1894 6¢ NEWSPAPER ISSUE. 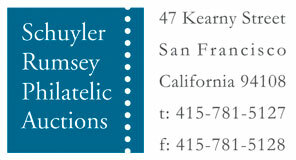 It is contended that the 1894 6¢ Newspaper issue is woefully undercataloged in the Scott catalog. 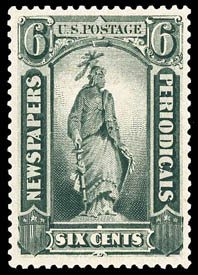 Only 9,705 stamps were issued of the 6¢ and in comparison to the 36¢ issue of this series (PR97) with 9,935 issued and having a catalog value of $60,000.